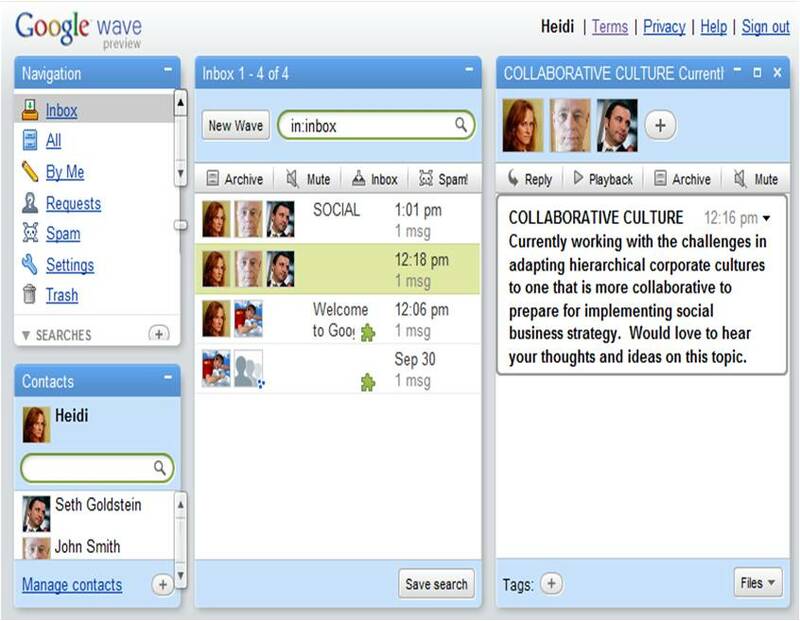 I just started two waves on Google Wave about “Social Business Strategy” and “Collaborative Culture”. As the invites to the Google Wave beta only went out today, we will see if this wave grows. So far, no response and only four of my contacts are on there, but they are 10 time zones away. So, I invite you to join the wave if you are there and let me know who else is out there. I like the concept, but sure is hard to test when limited the invited test group. SOCIAL BUSINESS STRATEGY: Let’s define it together. Applying social technologies to add value to your organisation requires cultural shifts for implementation to succeed. Leadership needs to be 100% committed and engaged in the process for it to succeed. Trust is critical. Monitoring and Measuring is important to get commited engagement and verify results for ROI both in time and money. The technologies are the tools, the people are what make social business strategy effective. COLLABORATIVE CULTURE Currently working with the challenges in adapting hierarchical corporate cultures to one that is more collaborative to prepare for implementing social business strategy. Would love to hear your thoughts and ideas on this topic.